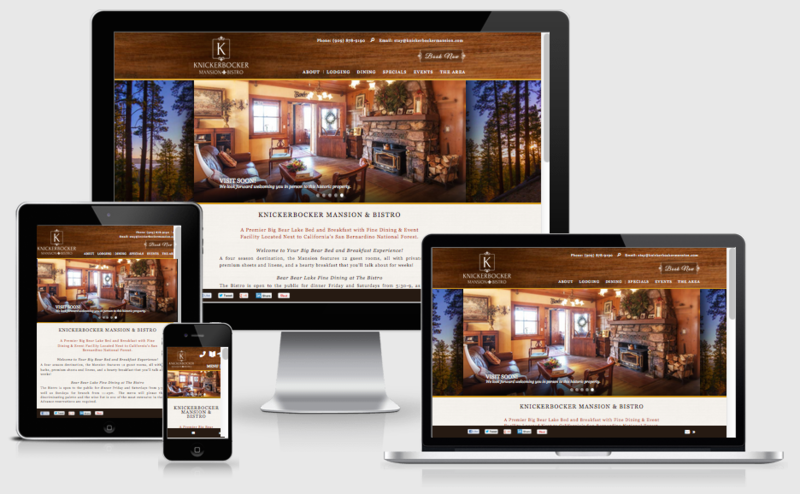 We are pleased to announce the August 20 launch of the custom responsive WordPress website for Knickerbocker Mansion at Big Bear Lake, California. The custom responsive WordPress website design for Knickerbocker Mansion ensures a great user experience no matter what device is used to view it. Vickie & Ed Harris, the new owner-innkeepers Knickerbocker Mansion, a longtime web client of InsideOut Solutions, knew it was time to redesign the inn’s website and contacted Pat McCauley to request a proposal. 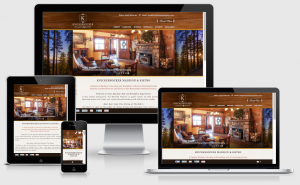 Pat reviewed the current website for this luxury Big Bear Lake B&B and put together a proposal that included a complete redesign in WordPress using a custom responsive theme that would ensure the website would look its best on whatever device was used to view it. In addition to the proposal, Pat also recommended photographers to contact for getting new photos of the bed & breakfast. She also gave the new owners advice on transferring the Mansion’s online accounts (Facebook, Google+, Pinterest, Yelp, etc.) from the previous owners. Knickerbocker Mansion is a luxury B&B inn, bistro and event venue located next to the San Bernardino National Forest at scenic Big Bear Lake, California. 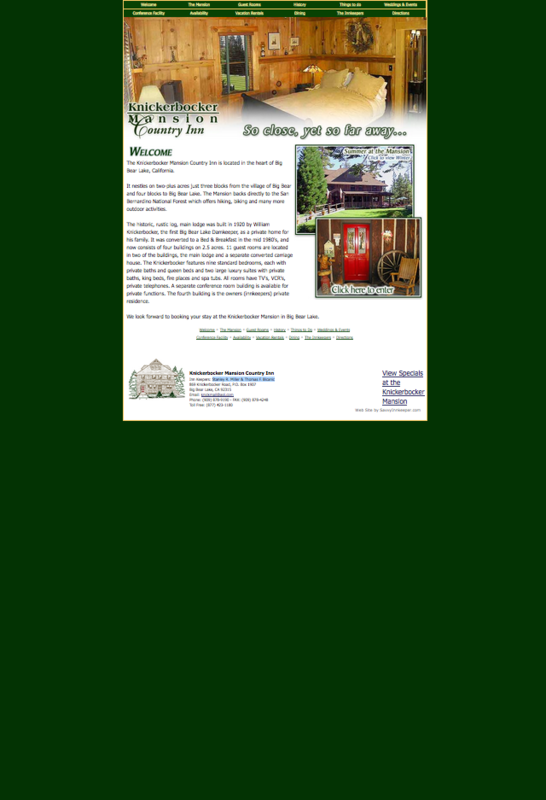 Previous innkeepers Stanley Miller & Thomas Bicanic became web design and hosting clients of InsideOut in late 2002 when we launched their website. 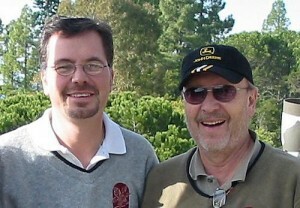 With InsideOut’s WebTools, Stan & Tom were able to edit page text and photo galleries, but nothing else. The Knickerbocker Mansion website as it appeared on its 2002 launch represented the web design standards of its era, but had fallen behind the times by the late 2000s. The website received some minor upgrades over the years, but by the time the inn changed hands in mid-2014 to Vickie & Ed, they knew it was well past time to rebuild their website from the ground up in a Content Management System (CMS) that would make it easy for them to make changes they couldn’t with the existing site’s CMS. The new owners wanted a website that not only was effective from a development point of view, they wanted one that projected their own marketing message. They worked with Pat to hammer out their needs and wants and decided upon a custom responsive WordPress website that would put their site on the cutting edge of web development. First, though, Vickie & Ed needed to update the existing website and gather the materials they would need to provide InsideOut to create the new website. AFTER: The new Knickerbocker Mansion logo evokes the elegance of the B&B at Big Bear Lake. A new logo, some new photos and revised text freshened up the Knicker Bocker Mansion website a bit, but it still looked like what it was: a site over a dozen years old with no mobile-friendly solution. New photographs of the mansion would need to be supplied. Vickie chose to work with Pat & Beth’s top recommendation: Phil Tauran. The results of his efforts, and Beth’s attention to optimizing them for viewing on the web, speak for themselves. 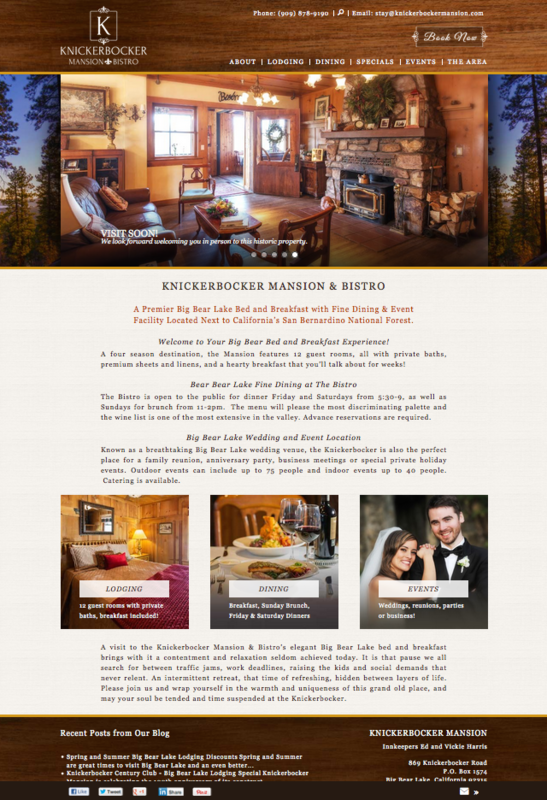 AFTER LAUNCH: The new Knickerbocker Mansion website’s layout captures the essence of a stay at this historic home at Big Bear Lake. Once the existing website was updated with the new logo and content, it was time for Beth to work with Vicki on designing the “look and feel” of the new website that accurately captured the atmosphere that came with new ownership of the B&B. Beth used Vickie’s concepts, questionnaire responses, and the new photo and logo to create a layout that emphasized “relaxing elegance” which fit both the inn and its location at California’s Bear Lake. It only took minor tweaks to get the new owners’ avid approval. While Taylor created the WordPress platform, Beth gathered and organized all of the information and materials from Vickie. Taylor handed off the complete framework to Beth and she then turned to adapting and optimizing each visual and textual element to the website. This, like all websites built by InsideOut Solutions, was no cut-and-paste or drag-and-drop job. Beth carefully edited the new photographs and text to take advantage of the custom responsive WordPress website design, ensuring each page retained a clear message looked its absolute best. Search Engine Optimization (SEO) on page content and “behind the scenes” code were applied via page edits and the Yoast SEO plugin during the proofing process. Redirects were created for all search engine-indexed URLs of the previous website to ensure “page not found” errors would not have a negative impact on search engines or visitor experience when the new website launched. 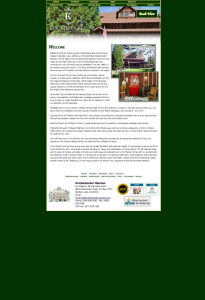 The new Knickerbocker Mansion website was submitted to the search engines for speedy indexing after its launch. If you have a custom WordPress website we designed that’s four or less years old we can provide you with a cost-saving responsive upgrade. Custom WordPress websites developed by InsideOut Solutions that are over four years old will typically require a full responsive redesign. 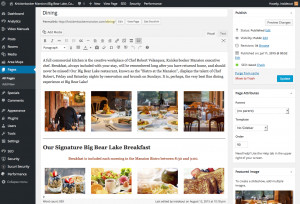 Don’t have a WordPress website? 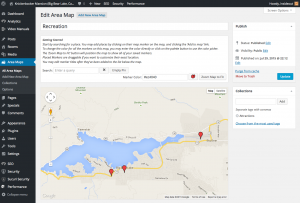 We’ll build you one with a custom responsive WordPress theme. Contact us today for a quote to keep your website and its internet marketing effectiveness ahead of the curve.